Like our Horsley customer, are you both a parent and a pet owner? If yes, then you can appreciate their everyday struggle of keeping their lounge clean. Take preventive measures like using a cover for your couch. 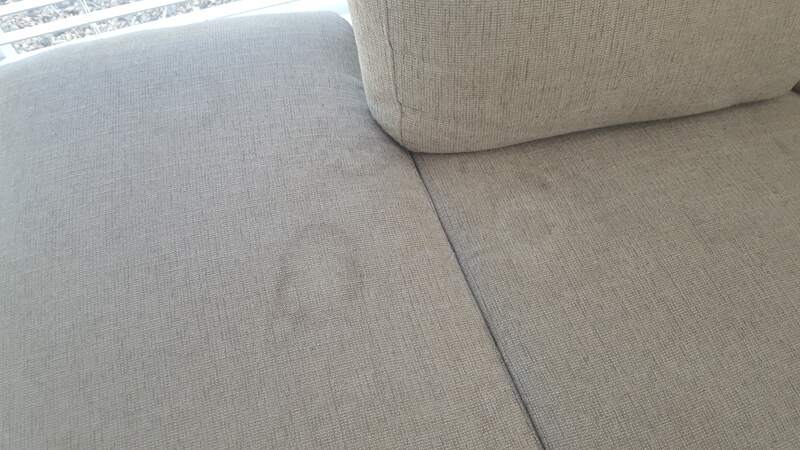 Before cleaning – a dog slept on this lounge, then a baby vomiting on it! Clean any stains as soon as they happen and before they set. We recommend using a ChemDry Spot Remover which you can buy from a ChemDry technician during professional upholstery cleaning. Vacuum your lounge regularly to remove any dust and dirt particles. Groom your pets often so they shed less hair onto your sofa. 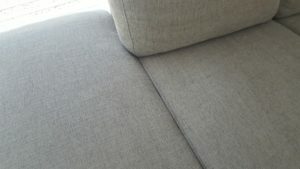 Your best tip is to call professional upholstery cleaners like Jason and Tanya every 6 to 12 months. Professional cleaning can extend the life of your lounge, especially if you have toddlers and pets. Beware of retail household cleaning products that may cause harm to your children and pets! Our customers in Horsley were smart enough to call Jason and Tanya when they noticed severe stains. They worried that harsh chemicals could be hazardous to their baby and their pet. First, he pre-sprayed it with ChemDry’s Green Monster Pre-spray. Next, he used a horsehair brush to agitate the Pre-spay and waited 10-15 minutes for it to dwell. He then sprayed on Upholstery Wet Foam and again brushed the lounge before he used hot wet extraction. Jason also used ChemDry’s Oxy Spotter and a little bit of Double Indemnity for the tougher stains. All products Jason used are Green Certified and safe for children and pets. 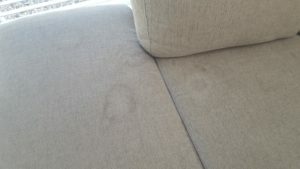 If you are in Wollongong or surrounding areas and want help to clean stubborn stains and marks on your upholstered lounge, call Jason and Tanya on 1300 364 636.